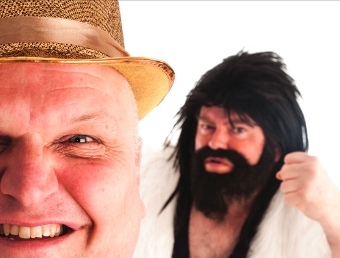 THE knockout tale of the rise and fall of British wrestling is heading for Surrey. To people of a certain age the words ‘Big Daddy v Giant Haystacks’ conjure up thoughts of the bout of the century. Now a play of the same name comes to the Mill Studio at Guildford’s Yvonne Arnaud Theatre from Friday to Saturday, September 26 to 27. It tells the story of two fat men (aka Shirley Crabtree and Martin Ruane) who were the weekly stars of a drama which unfolded at 4pm every Saturday, from 1976 to 1988 with millions tuning in for TV’s World of Sport wrestling fixtures. The play is a two-hander recalling a whole nation during its most colourful era. Co-writer Brian Mitchell explains: “Apart from the brilliantly colourful characters, the reason we wanted to create this play is because the story has a lot in it that we think has contemporary resonance – there’s corruption, exploitation and people simply not listening to public protest.